The Tuquet Monceau vineyard is located in Bergerac in the municipality of Saint Vivien. This great land of hills, run by Cecile and Eric Goubault Brugière since 1989, is situated halfway between Saint Emilion and Bergerac. The house is perched on a hill hence its name of Occitan origin : the mound or 'Tuquet'. Soil composition is important when you want to produce fine wines. The clay and limestone of Tuquet Monceau offers excellent drainage thanks to the composition of the vineyard plots. After 15 vintages the passion for wine and vine still runs strong in Cecile and Eric's veins. From 3 hectares of vines and 20 hectares of meadows in 1989, they now operate 25 hectares of vineyards and 60 hectares of meadows where 50 pure breed Charolais and Limousine cattle are raised along with the grain needed to feed them. With quality as their primary motivation, they converted the vineyards to organic farming and are certified since 2012. Technical investments are also part of their future plans for a long term sustainable business. They produce 3 colours, 3 appellations and 4 different wines: a Montravel dry white wine, a Bergerac Rosé, and Bergerac Red with a premium cuvée aged in oak. 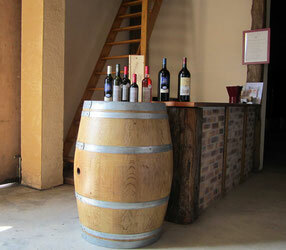 Cecilia & Eric Goubault Brugière will be happy to welcome you to discover their work and enjoy their wines. No, Tuquet Monceau wine does not come from a water well, but from our great Earth. It is fashioned with passion, hand work and heart for our happiness and that of our customers. One feature of Montravel is its altitude. Mills still make up the panorama of our hillside like this one, the St. Vivien Mill.